New Hampton Creations, Inc. - A PREMIER SOURCE FOR ALL YOUR HOSIERY NEEDS! Welcome to Our Web Presence, and Thank You for Visiting! For those of you that do not know who we are we will tell you! 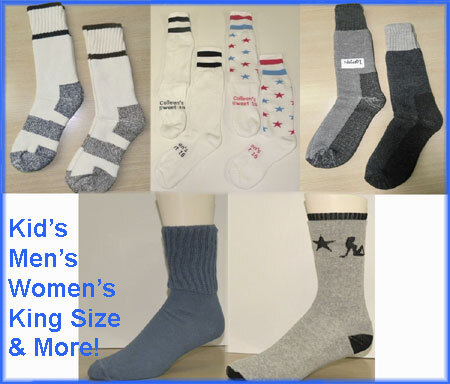 We are a unique company, because If you see something made in hosiery, whether it is socks, sheers, tights, and/or trouser socks from - Infants, toddlers, children (boys or girls), ladies, queen sizes (up to 550 pounds), men's, king size’s or super king size (size 21 sock size), WE EITHER MAKE IT OR CAN MAKE IT! So..."Sock" it to us! We can take it! We are here for all of your sock/hosiery needs! A PREMIER SOURCE FOR ALL YOUR HOSIERY NEEDS! Welcome to Our Web Presence, and Thank You for Visiting! WE EITHER MAKE IT OR CAN MAKE IT! So..."Sock" it to us! We can take it! We are here for all of your sock/hosiery needs! We design, create and manufacture hosiery products specially suited for your needs. We have customers in all categories from Brick and Mortar Retail Stores, to Catalog houses, Internet Companies, Health Care Companies to the US Government. When you work with us, we ascertain your customer base and demography, and then we aid you in developing product suited to the needs of your customer. We have a vast knowledge of Hosiery Knitting Machines, their capabilities, along with a wealth of information regarding yarns and the different kinds of yarns available to develop different products. Too often you hear vendors say, “This is one of my top 5 selling items”. Although this is a true statement it may not benefit your company. To us, it does not matter which items are our best selling items, It is our job, our responsibility and our duty to create products which become “One of Your Top Selling Items”. This is our goal and we take it seriously and personally. Although most of our products are manufactured in the United States, we do import goods from the Dominican Republic for socks, Turkey for Sheers and socks, Pakistan for Athletics and China for both Sheers and socks. We have representation in China who will find a plant to produce products we need made specifically to our specifications. All overseas plants that we utilize are ASO 9000 certified. Copyright 2010 New Hampton Creations, Inc., www.nyshose.com. All rights reserved.